My plan for Thursday was to get to the Javits by 6:45 am so I could get a ticket for Mary Higgins Clark’s signing. I woke up late though, so I didn’t arrive until a little over 7 am – but fortunately, they still had 1 ticket left for MHC. I also picked up a ticket for Tim Gunn and R.L. Stine. Then I went and got in line for the Adult Author Breakfast with Candace, Dawn, and Swapna (S. Krishna Books). While in line, Donna came by, and I was able to give her my ticket for R.L. Stine, which she put to good use (she's a HUGE fan). Once we were allowed in, we hustled over to a good table (facing forward) and dug into our bagels. I was very excited about the line-up. I don’t get to watch The Daily Show often, but Jon Stewart always cracks me up, and the breakfast was no exception. I was very touched by Condoleezza Rice’s speech about her parents raising her to be extraordinary. I’ve only ever read THE FIRM by John Grisham, but he’s a legend, so it was cool. And Mary Roach was probably funnier than Jon in her speech, which really got me looking forward to PACKING FOR MARS (the only actual book we got, since the rest all still need to be finished apparently). Once they opened it up to audience questions though, the program went rapidly downhill. Why is it that no one in the room could ask a non-embarrassing, non-self serving question? There were a bunch of self-pubbed authors promoting themselves and aspiring authors asking the wrong questions (i.e. asking John frakking Grisham how he deals with conflicting feedback from agents). I couldn’t bear it any longer and had to leave early. My first stop was Simon & Schuster to see if they had any copies of Cassandra Clare’s CLOCKWORK ANGEL left (it was 9:10 am already, and only 300 copies were being put out at 9 am, so I had my doubts) and they had a couple, so score! I wandered around the booths again, eventually ending up at Sourcebooks for Cameron Stracher’s signing of WATER WARS. I then joined the LONG line for Mary Higgins Clark, and ended up waiting with Kathrin (Secret Dreamworld of a Bookaholic) who also came over all the way from Germany. Since the next line over was so short, and Author Staci Boyer looked so motivating in person, we scooted over there to get a copy of MOTIV8'N U. Next I went to Chelsea Campbell’s RISE OF RENEGADE X signing. She had these cool embossers where you could choose to be a villain or hero. I asked her which she thought I was, and she pulled out a third, which was just an X, to emboss my book. I’m a mystery, I guess. While in line, I met Rebecca (Rebecca’s Book Blog) and we decided to go over to Laure Halse Anderson’s FORGE signing. We were more than a half an hour early and the rep insisted the line hadn’t formed yet, so Rebecca agreed to hold my place while I went to say hi to PJ Hoover at her EMERALD TABLET signing. When I got back, I noticed the line was SUPER long…as in no end in sight. Fortunately, Rebecca had staked us out a pretty good spot (next to Natasha, in fact). When I made my way over to Beth Kephart’s DANGEROUS NEIGHBORS signing, I found out the time had been postponed, so that was a real disappointment. 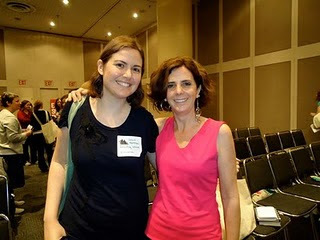 Instead I decided to go to the YA Authors of the Editor’s Buzz panel where I again ran into Michelle, Angie and Jenn. Authors on the panel were Erin Bow (PLAIN KATE), Rebecca Maizel (INFINITE DAYS), Ally Condie (MATCHED), Sophie Jordan (FIRELIGHT ) and Kody Keplinger (THE DUFF). (BTW - Look for my mini-review of MATCHED tomorrow.) All read a short excerpt and all sounded like winners, so we’ll see! I walked with Angie over to Jeri-Smith Ready’s SHADE signing where I met Diana Peterfreund. Afterwards, Diana and I met Daniel at a diner close to the Javits and he gave her a special illustration of his Buffalo slaying a unicorn (a nod to her killer unicorn novel RAMPANT). We had a great time chatting, though I wasn’t aware I could have pressed her for details on her upcoming dystopian retelling of Jane Austen’s PERSUASION. Why didn’t you tell me Angie?! Now since it was our 4th wedding anniversary, I decided to skip the Book Blogger Con Author Reception and hang out with Daniel instead. Since it started POURING rain, we ended up in the hotel diner again. Unfortunately, this meant we had to miss The Book Smugglers party too, which is a total shame. But hey, you can’t do it all! Since Daniel was leaving on Friday to go back to Germany, I skipped the BBC breakfast to dine with him one last time. He escorted me to the Javits and we hung out with Michelle at the registration desk for awhile (meaning I missed most of Maureen Johnson too) before he left. If you want to know more about the panels, allow me to direct to you to Kim’s (Sophisticated Dorkiness) recap. I thought they were…fine. Panelists were well chosen for the topics and the topics were interesting in theory, it was just that they did not always lead to the most exciting of discussions. It seemed there was too much like-mindedness and not enough dissenting opinion. In any case, my favorite part of the BBC was the social aspect, especially getting the chance to hang out with Sarah (Forever Young Adult, one of my new favorite blogs) and Angie (I forced both of them to stay longer than they wanted to). I would’ve loved a “getting to know you” panel, where everyone in attendance had a minute to introduce themselves and their blogs. I feel like I missed out on meeting so many people just because I didn’t know what they looked like. That said, it was so cool to finally meet Chelsy (Big Honcho Media), Nat (In Spring it is the Dawn – thanks for the red bean candy from Japan! ), Avis (She Reads and Reads – didn’t recognize you without your cat), Beth Kephart and so many others. After BBC ended, Amy, Natasha and I slowly made our way towards a big blogger dinner at Dos Caminos. This was so much fun as I finally had some time to hang out with Allie (Hist Fic Chick), Jen (Devourer of Books) and Carey (The Tome Traveller). I also said my teary goodbyes to Trish (you rock, you know you do!). I needed to go back to my hotel to pick up my bags, so I went on the subway with a group that was headed back downtown, including Amanda (The Zen Leaf) who told me all about the dystopian books she is writing (fascinating!!). 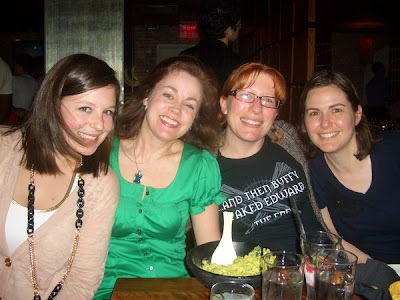 After spending half an hour begging the hotel to release my bags to me (long story), I hurried off to Nicole’s for our post BEA slumber party and a fun edition of THAT’S HOW I BLOG (which you can listen to here). After carrying suitcases full of books up and down many a flight of stairs and getting lost in the subway on the way to the airport (I made it with literally 1 minute to spare), It was time to relax (which is why it took me so long to post these recaps, sorry). But guess what?! I’m all ready to do it again. See you next year? WOAH, Lenore, you look like you had *such* a good time!! And I never even jnew that you could buy special tickets to jump the queue like you can at an amusement park?! how bizzare! I am trying not to be immensely jealous that you got a copy of Clockwork Angel, but because I like you, i'll let this one fly. HA. You sure did pack a lot in! When I read other people's posts, I feel like I missed so much! I am more than ready to go back next year! 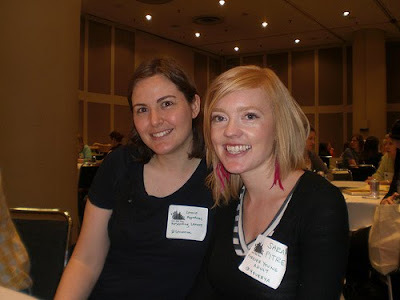 I think we should have the book blogger stuff BEFORE BEA next year, to get to know each other first. I agree, I would have loved more time to hang out and meet people. ooh, who's that hottie IN THE FOREGROUND?!! lenore, it was obvs totally fabulous to meet with you and snark about YA together. next year let's make sure we get in more quality discussion (and drinking). Chelsy from Big Honcho Media was there?! I also read Forever Young Adult, and didn't know she was there either! All I was doing was just sitting in a corner reading, lol. I could've seen all these people and chatted for a few minutes. Le sigh. Next year though. Love that drawing of the buffalo slaying the unicorn. Yay for Diana- she's so sweet and awesome! And I am definitely going next year. 2012 will be in CA and that's too far, so I need to go next year. I will also plan better because I just missed out on meeting so many people in person that I felt bad for either not working something out in time or forgetting that they live in NYC (e.g. Julia Hoban) until too late. Carla - Yeah, I'm thinking those "jumping" queue tix are pretty pricey, but I never checked b/c they were already sold out. Def. save up! So worth it! Kathy - Even though I packed in a lot, I still feel like I missed so much! Beth F - I will get you your chocy eventually..never fear!! Amanda - That is exactly what I am thinking! Before!! Nymeth - There are just so many people there and activities going on, you know you can't get to them all. BookChic - I saw you reading outside. Must have been a great book to keep you away from all of us! Wait, BEA is going to move out of New York? That shocks me! I'm glad you had such a fun and busy time...it was so good to see you and Daniel! It was Tell Me A Secret by Holly Cupala (then Grace by Elizabeth Scott), but the main reason I stayed out of the way was because I hadn't paid for the BBC and I didn't want to get in peoples' way or be accused of being a stowaway and kicked out of the Javits. :P I was out front early on because I hoped I could hear Maureen's speech anyway, lol. I love that woman- she's so funny! Unfortunately, I couldn't hear anything except for laughter, but I did see her leaving though. Amy - I always love hanging out with you!! BookChic - If I had known you had GRACE, I totally would've attacked you!! And yes, Sarah's blog is like one of the the most awesome thing ever! Love your idea for the get to know you panel at BBC! Oh! You should have stayed at the panel in the morning. Jon Stewart got up there and pretty much asked the audience "does anyone have any questions that does not require advice or help from these authors?" Everyone clapped at that. I admit, I couldn't help groaning at those questions either. I mean, here you have all these fantastic people and your one chance to ask them ANYTHING! Silly people. Jenny and Polish - I was still there to hear those things! I loved that Jon said that!! I will definitely see you next year! did you score a copy of Forge?? I'm so jealous that you got to meet her!! I love Anderson. What a thrilling day! What a great review of your day -- super comprehensive! I'm jealous you got to meet Tim Gunn, I bet he'd be funny in person. Thank you again for coming by my signing! I would have gone all fan girl if I met Tim Gunn!! It is truly fascinating all these different bits and pieces that make up the whole. I'm still not sure I get how it works exactly. It is done in a very un-British way so I think it is just so different from here that my brain does not compute. I like the sound of the one minute show and tell type bloggy thing though. Wow! It sounds like you met an awful lot of amazing bloggers and authors!! I can imagine that the atmosphere was super-charged, what with all the great books and author signings going on all over the place! I so want to be able to make it next year. It sounds like it would be a wonderful experience! Glad you had such an amazing time. I just love your recaps. And I agree a meet-and-greet moment where bloggers introduce themselves would be great! You get cuter with every photo. *jaw drop* OMG I love Tim!!!! "make it work!!"